This is in continuation of the previous post where it was asserted that although history glorifies the slaughters of a few generals/kings, the common population by large was peace loving. The soldiers (esp. green ones) would prefer to be killed rather than kill. The 24,000 loaded muskets from the 1863 Battle of Gettysburg are often cited as an example. A lot of people relate to unloaded muskets as peaceful nature of common soldier, but they might be misinterpreting the facts and ignorance of the reality of battlefields. Both sides were using a popular British army rifle Enfield 1853 which had a .577 bore but the standard American ammo was .58 caliber. This might seem like a small difference, but after 2-3 fires with blackpowder fouling, hangfire or barrel injury was almost guaranteed. Springfield m1861 had a design flaw in the barrel which made it prone to misfire. The machining of gun parts in that era was poor and the shortage of weapons was so rampant that a lot of soldiers brought their own hunting rifles. Many makeshift workshops were created to meet the demand and there was hardly any quality control process. Add to it the stress/confusion of being fired upon, wear-N-tear of the battlefield, damp gunpowder and tedious loading mechanism; you create a concoction for failure. Smokeless gunpowder was not invented and guns often used to get jammed and barrels clogged if not maintained properly. With 46,000 casualties on the day of the battle it was easier for a soldier to salvage a new rifle than to repair one. Hence a large number of “defective” loaded guns would appear in the field. Guns in those times produced a thick smoke cloud which impairs visibility and aim. Hence commanders would order their troops to follow a synchronized loading and discharge ritual. This way the smoke would clear by the time your troops are ready for next round. While smoke cloud from the synchronized discharge would make it harder for enemy to aim and allow you to gain a few inches (or half a mile of Picket’s Charge with a loaded weapon). So the best time to shoot the enemy is to wait till the smoke clears but not too long that the enemy commander gave orders to fire. As a result the incapacitated enemy was invariably holding a loaded gun/rifle with their hands around the trigger. Fire, Cool, powder, bullet, ram, aim and shoot again was the sequence. Chances are that you could jam your perfectly well maintained weapon by loading the bullet first and the powder later. 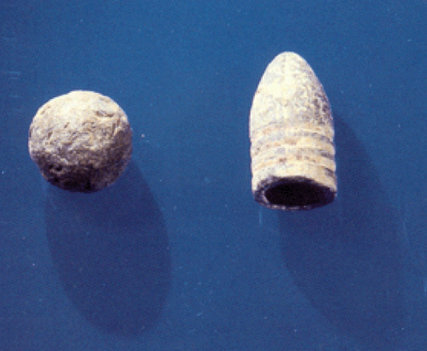 The muskets balls were replaced with a tighter fitting Minié/Minnie balls and if you rammed it wrongly or the manufacturing defect made bullet was too large to exit properly and there is no easy way to get it out. The only remedy was to dismantle the weapon, clean it and reassemble it. It is possible to do it in a foxhole but not in the open battlefield march of Gettysburg. The commanders insisted on soldiers continuing to load as a show of discipline and training. Everybody noticed if the neighboring comrade whom you are standing shoulder to shoulder was not firing and were inspired that you still continued to be part of the battle by loading and following orders. The 95% time to load 5% time to shoot is true for somebody practicing in the safety of their backyard. When people get shot at and feel threatened they get into a kind of adrenaline rush frenzy. The time it takes to perform mechanical tasks like reloading which are part of the muscle memory gets shortened drastically while focus, aiming and precision tasks takes much longer. Commanders of that era accused solders of over-aiming (reduced rate of fire due to spending too much time to aim). Hence there is a higher chance the person was aiming with a loaded rifle when he was shot. Lastly one should not underestimate the fact that common foot soldier was underfed, did not have good boots/coat to protect against weather, underpaid and under trained. With poor living conditions, poor hygiene in camps, prevalence of disease, blood and suffering reduced the morale considerably. Desertion was prevalent and these poorly trained militia/farm boys (as the commanders used to mock them as) might not have maintained the weapon properly. Every time you fire black powder, the chances of barrel fouling increases. In the confusion of the battlefield, some would not have been trained enough to know that their weapon was not firing and would load it multiple times. Also who had time to fix a hangfire in the middle of the battlefield. Whatever is the reason, it is only a speculation and there is no way to truly determine what happened that day. However there are several theories that point that loaded weapons were because of the culture and practices of the battlefield of the time. The loaded muskets are not a reflection of the psychological dilemma faced by a piece loving soldier who was ordered to shoot. If they wanted not to harm, they would have fired in the air rather than repeatedly loading their guns.